Hello there how are you? I know I have been a bit quiet but I ended up working full time this week and that always leaves me with little blogging time. 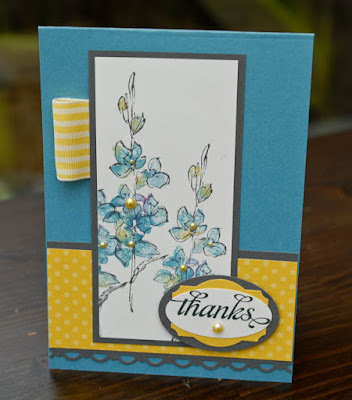 I have been creating though and I have another card using the baby wipe technique, you re maybe sick of seeing them but I stamped so many images while I had all the supplies up and is a shame to let them go to waste. 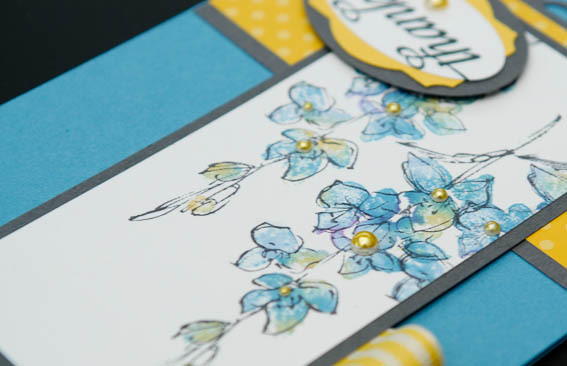 Sharni's love for yellow has made me play a bit more with this gorgeous Daffodil Delight. I have used it in the ribbon and the designer paper, paired it with Basic Gray and Marina Mist, I am honest I would have loved to add Basic Black as I love strong contrast but NOT with Marina maybe with baja breeze or bashful blue. I am liking the combo I am just not wowed by it. I have also used daffodil delight reinker and shimmer paint to colour my pearls. Here's a close up for you to see the coloured pearls. I like the things you make so much. So pretty!!! I love your pearl trick! You're a rock star!!!! Wowza - love that colour combo, Monica! Love your card - lovely image and gorgeous colours. Love that colour combo - fab.